money flow. The closer the index is to 0, the more negative the money flow. Long Entry threshold could range between 20 to 30; Short Entry values could range between 60 to 100. The Trader optimizer found these rules for trading 100 shares. The Trader optimizer found the above rules for trading 100 shares. number of shares, the Kelly formula and Optimal f.
when a trade has no initial protective stop. Note that the Kelly Formula can result in suggesting 0 or negative shares/contracts/units be traded for a strategy with a losing history, in which case NeuroShell Trader simply uses one share/contract/unit for trading to reduce risk to a minimum level. methods included in Trader Professional. For details on the different methods, click here. 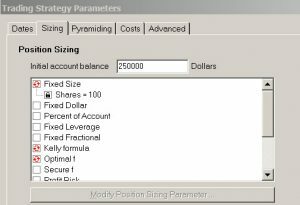 For Trading Strategy #2 the optimizer chose Optimal f as the position sizing method. the Trading Strategy will no longer make actual trades and will show trades of zero size. the start of the out-of-sample period and continues to rise upwards. Click here to download the example chart.